ABRAPALABRA | What Does ABRAPALABRA Mean? 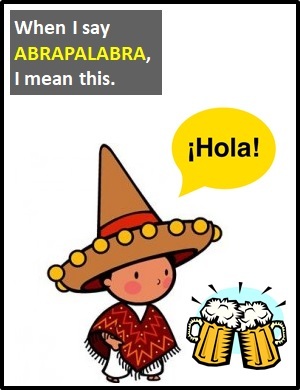 ABRAPALABRA means "The Ability To Speak Spanish When Drunk". The term ABRAPALABRA refers to the increased confidence a person feels when they try to speak a language when intoxicated. It is a play on the words "abracadabra" (the "magic word") and "palabra" (which means "word" in Spanish). Although ABRAPALABRA most commonly describes the increased confidence felt by a someone attempting to speak Spanish when drunk, it may also be applied to any other language. ABRAPALABRA! After a couple of cervezas, my ability to speak Spanish improves dramatically. Person A: Your Spanish improves a little after each beer you drink. Person B: That's called ABRAPALABRA! Person A: Jeremy can only speak German after he's had some shots. Person B: He already speaks it well, ABRAPALABRA just gives him the confidence. This rum gives me ABRAPALABRA.